The Elmwood Bowling Club, a men’s club then, was formed in 1927. The Club obtained the use of a part of Elmwood Park, which had earlier been given to the Council by Sir Heaton Rhodes who had farmed the area, for a bowling green. A green was formed, now the No. 2 green, and as well a pavilion was built there on the east side facing Elmwood Park. Our Patron, Owen Jones, can remember looking across to the bowling green in the 30s and seeing bowls being played and the pavilion. Eventually, a second green was added, which became the No. 1 green, the pavilion on No. 2 was demolished and a new clubhouse, the present clubhouse, was built. The Club was a very successful men’s club for many years, but in the 1990s it became apparent that the numbers were deteriorating and that it was time to move towards becoming an amalgamated club and with women members. This was voted through, not without “one or two hiccups”, and the Club became an amalgamated club in 1996. The first two women to join, Mary Ann Johnstone and Jan Taylor are still members. Both of them remember playing in the then home and away Elmburn Shield and being the only women on the greens. 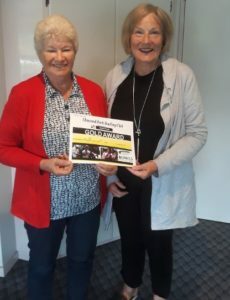 They were closely followed by current members Ann de Lambert and Olwyn Hyde (Dalley) while after some years very strong women players such as Bev Morel, Sherrie Cottle, Pam Phair and Lois Grey had all joined. The strength of Elmwood’s women’s bowls is evidenced by the number of National, including 7s, and Canterbury team and individual titles won over the years. The men’s teams have also been successful at the highest level Andy Curtain has represented New Zealand and Canterbury with distinction, while the Club has attracted other top players like Andrew Kelly, Stewart Buttar, Steve Ditfort, Paul McKinnel, Jonathan Flint and Ian Rule. MuzzaWeb thanks Neil Johnstone for thw above information. The St. Albans Bowling Club started in 1902 as a combined bowls, tennis and croquet club to cater for the citizens of the St. Albans Borough. The site chosen for the club was on the corner of St. Albans Lane (St. Albans Street) and Kerrs Lane (now Donald Place). This 1.5 acre section was part of Hon. J. T. Peacock’s Hawkesbury Estate. John Peacock became the first President of the club and he was a generous benefactor. During the first decade the club flourished and by 1907 had 300 members. There were difficult times during the Great Depression but the club managed to survive in spite of the secession of the Tennis section in 1930. The Croquet section struggled on until 1946 when it disbanded. During the Post World War II period there was an increase in membership when women were admitted to the club in 1948. The 1960s and 1970s were golden years for the club and the membership totalled 217. 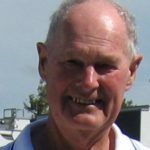 At this time St. Albans Bowling Club was regarded as one of the strongest in New Zealand when outstanding players such as W. R. Wilkinson, B. W. Sinclair and Kerry Clark were selected to play for New Zealand. The 1990s were a time of change. The old pavilion erected in 1903 was demolished and a new pavilion was built in 1994. In 1996 the men’s and women’s sections amalgamated and in the Centenary Year, 2002, Alison Bigg became the first women president. In 2005 the name changed to St. Albans-Merivale was made to more clearly show our location in the heart of Merivale. Over the years the boundaries of many suburbs have become blurred as new housing areas have grown. 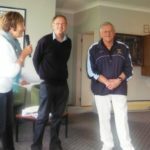 The confusion with St. Albans Shirley Bowling Club and the Edgeware Club in St. Albans Park has led to many players arriving at the wrong venue to play their games. Hopefully this change will help stop some of the confusion. FOR ITS CENTENNIAL CELEBRATIONS, 1902-2002. Christchurch City Library, Reference Section. 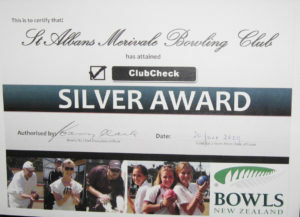 St. Albans-Merivale Bowling Club Gains The Silver Award, June 20, 2009. 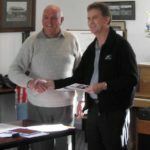 Vince Roper, from Bowls Canterbury, handing over the Silver Star Award to outgoing president Mick Tarling at the A.G.M. in June, 2009. 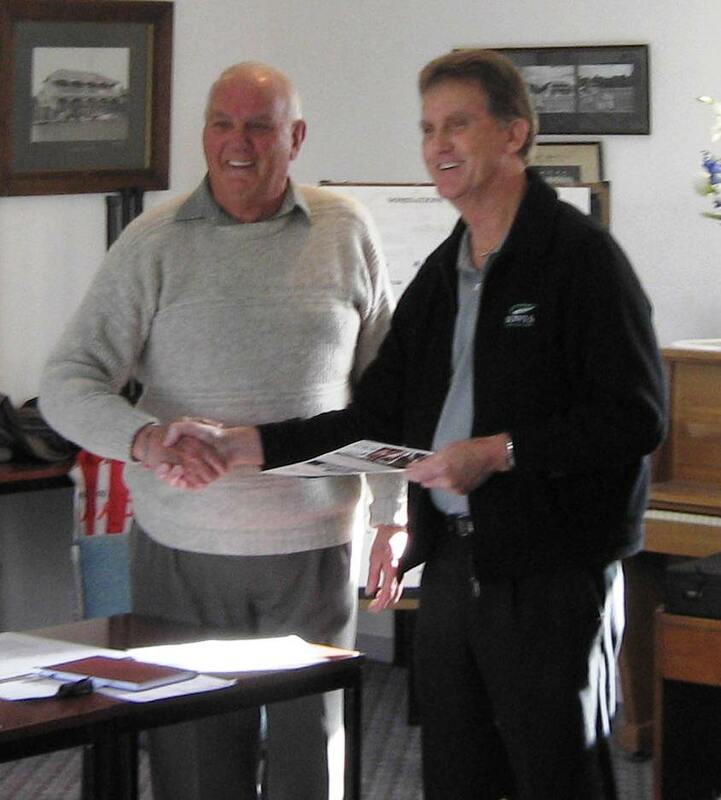 Under Mick’s stewardship the St. Albans-Merivale Bowling Club met extremely stringent criteria and became the first club to receive the award. The club got there by getting things done and making things happen. 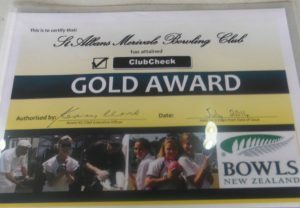 The club was very close to being awarded a Gold Star Award. 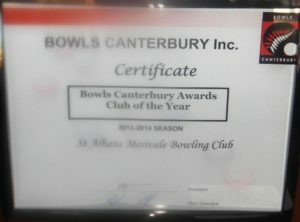 Chosen as Bowls Canterbury’s club of the year. 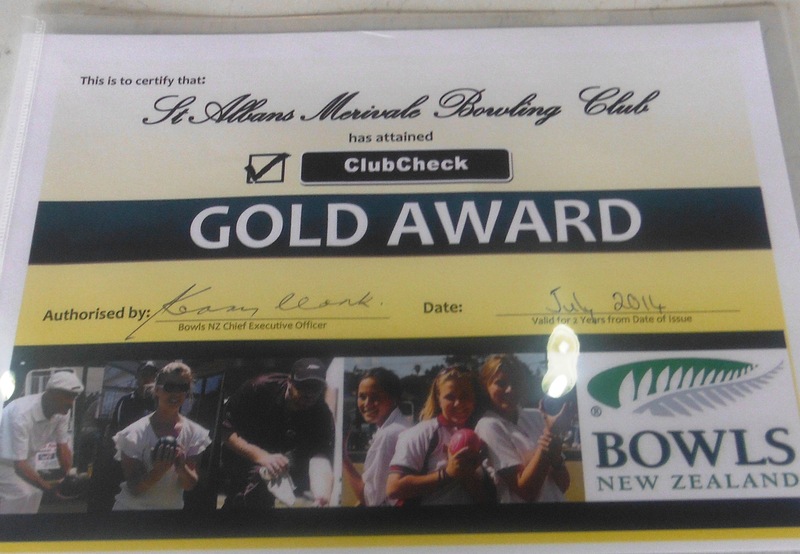 Bowls NZ is pleased to advise that in a recent assessment the St Albans Merivale Bowling Club has gained the Gold ClubCheck Award . 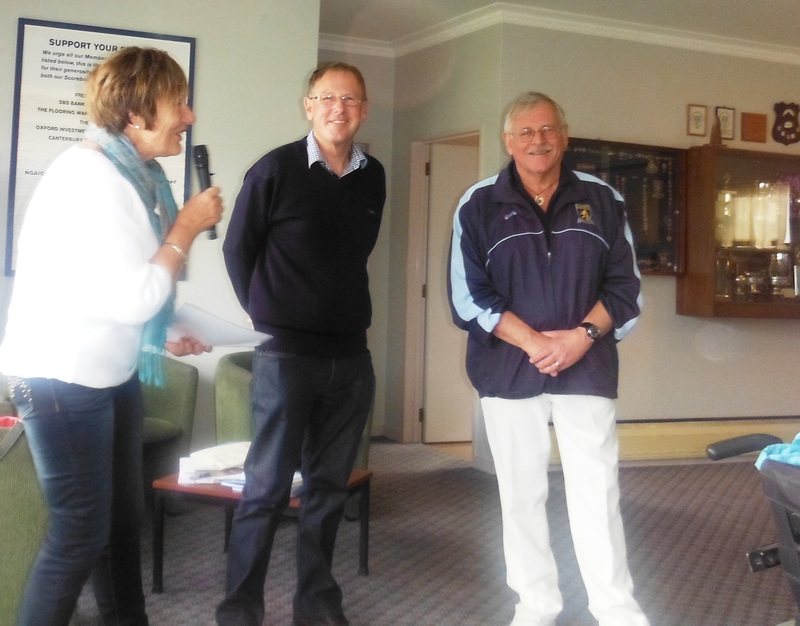 13 – 9 – 14 Lorraine McLeod of Bowls New Zealand handing over the award to the president, John Hampton, with Alan MacDonald looking on. Alan played a huge part in the gaining of this award. 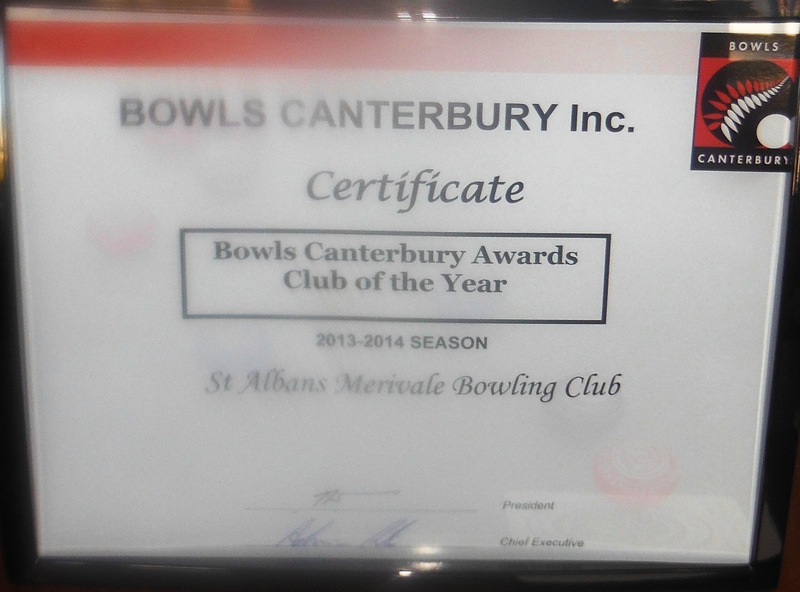 It was the 114th AGM of the St. Albans-Merivale Bowling Club. What a bitter sweet day. By only the barest of margins the members approved the motion to amalgamate with Elmwood. It was a sad day because a club with such a proud history will cease to exist but a good one as so many members realised that amalgamation was the only logical course of action. Once the dust settles MuzzaWeb is certain that the move will be looked at positively and we will look forward to belonging to a new club that has many plans for the future. 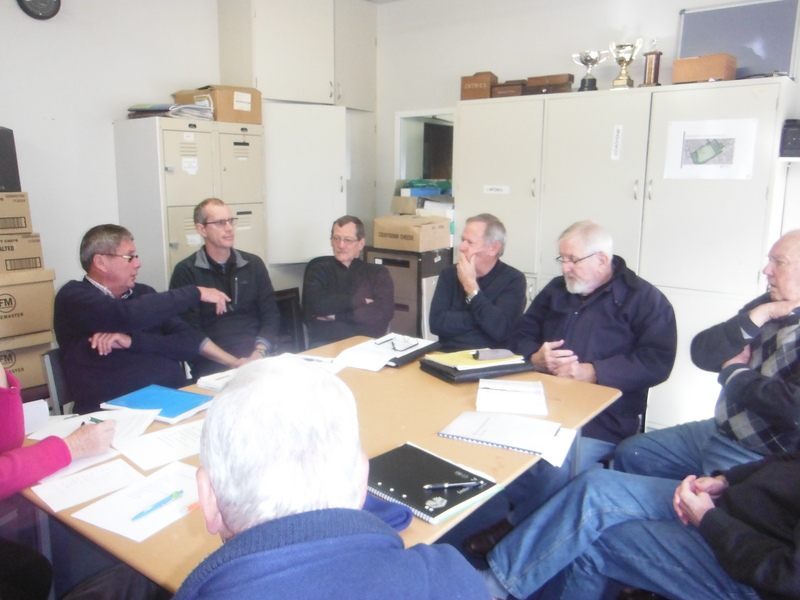 History was made today as members of both executives met for discussions regarding the amalgamation of the two clubs. St. Albans-Merivale and Elmwood. Pictured here are some of the committee. A huge amount of work will have to go into this. A new constitution will be formulated, a new club name will need to be chosen and new uniforms worn. Nothing will happen overnight. MuzzaWeb is quietly confident that with good will all round the new club will confidently and successfully move into the future. At a special general meeting, the first held by the new club, the meeting decided that the new club would be named the Elmwood Park Bowling Club.